We hadn’t left the dock yet and Gary Blasi’s hands were green, possibly closer to chartreuse. Perhaps stained was a more fitting way to describe the coloring on his palms, between his fingers and caked under his fingernails. I looked down at my clean hands, smiled and compared them to Blasi’s. Blasi, owner of Full Throttle Sport Fishing, targets king salmon on the Pacific Ocean out of Eureka, Ca., where salmon fishing couldn’t be hotter right now. With three to five guys on the boat daily, limits have been the norm and have come quickly when dragging brined bait. Everyone is trolling bait right now. 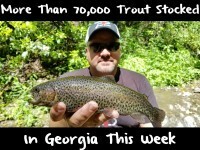 And, most are catching salmon. Unfortunately, we knew that wasn’t going to happen. The previous week had been marked by glass-like ocean conditions and no wind. Of course, with us trying to film Pautzke Outdoors, 15-20 mph winds arrived at midnight, prior to our 6am charter and currents were shifting. The ocean was rough and uncomfortable. Bait was to be pushed away from the mouth of the harbor and we, and the rest of the fleet, had to search for it, in order to find the salmon. Fortunately, we caught limits, but had to work a few hours for them. The past few seasons Eureka has been dynamite for Chinook. As long as high winds aren’t present limits have been common from when the season opens in May until September when it closes. 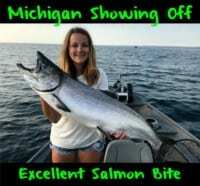 While most of the fish bounce between 15-20 pounds, those to 35 have been caught this summer. As the season progresses larger will show. Likely a reflection of large schools of bait in the area, enormous schools of salmon make this area their home during the summer, eating baitfish and bulking up before migrating to Oregon and California rivers, most likely Sacramento, Rogue, Klamath and Columbia fish, amongst others. Whereas many charters in Northern California run spoons and other baits, the entire Eureka fleet (as we saw first hand) drags Fire Brined anchovies fished on a Bechold Rotary Head. Not herring or sardines. Anchovies. And, while blue and purple have been top sellers on the West Coast, boats leaving out of this port all use chartreuse and green Fire Brine. It’s no secret what Blasi uses. A spaghetti strainer size, see-through container is latched on to the back of his stern. While trolling any passerby can see lime green juice (chartreuse Fire Brine) and anchovies sloshing around. And, even during the week there’s several dozen boats trolling in a confined area. At $5 a package, the fleet uses brine to make bait last longer, shine brighter, look more enticing and slicken up the scales. While the odd day happens, limits have been common this summer and it’s only going to improve. 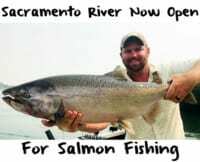 Eureka is keeping pace as the most consistent, hottest fishery in Nor Cal right now, a sign that Northern California and Oregon and in for another great salmon run. According to Blasi, most of the salmon they’ve caught have been hatchery fish, which usually means they’re headed to the Sac, he says. And, a clue that Blasi’s hands will remain green through mid September. Editor’s Note: Chris Shaffer is the Director of Operations for Pautzke Bait Company. He didn’t touch a single piece of brined bait on the excursion, but did load up on Bonine and didn’t get sea sick, even with seas at 9 feet, 9 seconds. Guide Gary Blasi operates Full Throttle Sport Fishing. For info on his guided Pacific Ocean king salmon trips please visit http://fullthrottlesportfishing.com. Anglers may keep two adult king salmon per day.